SANTA ANA, Calif. — A watchdog organization that releases a report each year on the global persecution of Christians has again named North Korea as the most dangerous place to live as a Christian—for the 16th year in a row. 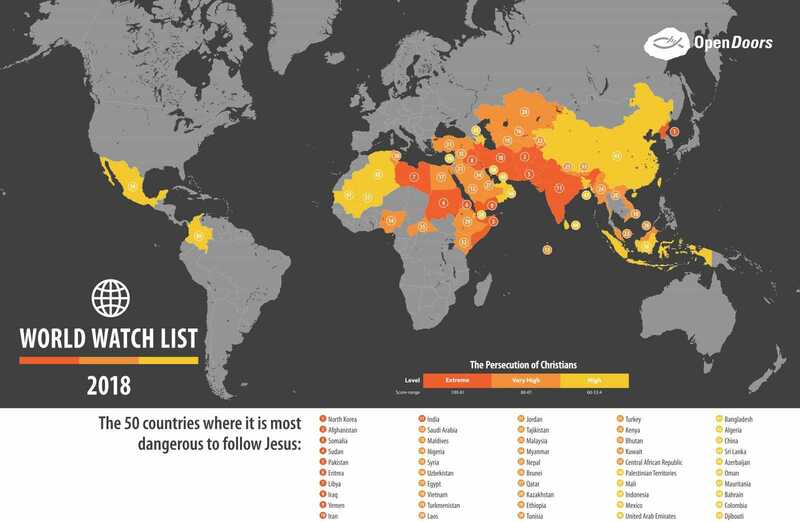 Open Doors USA released its “World Watch List” on Wednesday, which lists and ranks the 50 countries that are most hostile toward those who follow Jesus. It estimated that 215 million Christians in those nations face significant persecution, with 3,066 of those who professed faith in Christ being murdered during the reporting period. A tally of 1,252 were abducted, 1,020 were raped or sexually harassed, and 793 houses of worship were attacked. The organization especially expressed concern over what appears to be an increase of attacks against women. As it has for over a decade, Open Doors USA placed North Korea at the top of its list. An estimated 50,000 people, including Christians, are believed to be in prison or forced work in labor camps. While North Korea was the worst persecutor on the list, Open Doors USA noted that Afghanistan was not far behind. “Afghanistan now meets the same level of persecution as North Korea in five out of the six areas [used as the criteria for ranking]. This is a tragedy considering the efforts being made by the international community to help rebuild Afghanistan are failing to ensure freedom of religion,” he lamented. The report outlines that because Afghanistan is Islamic by its Constitution, there is no tolerance toward those who convert to Christianity. Those who turn to faith in Christ may lose their property and their livelihood, and may be beaten or even killed. “Pray for Christian converts from Islam, who face strong pressure from family, friends and neighbors to recant their Christian faith,” the report urges. The other countries in the top 10 of the “World Watch List” are also either predominantly Muslim or considered to be Islamic nations, with Somalia, Sudan, Pakistan, Eritrea, Libya, Iraq, Yemen and Iran being among the most dangerous places to live as a Christian. 35 of the 50 nations on the list are largely Islamic, prompting Open Doors USA to note that Muslim “extremism” continues to be the “global, dominant driver of persecution” in the world today. Open Doors USA encourages Christians and their churches to pray for these countries, and includes prayer points for each nation on its list. The full list of 50 countries may be viewed here.